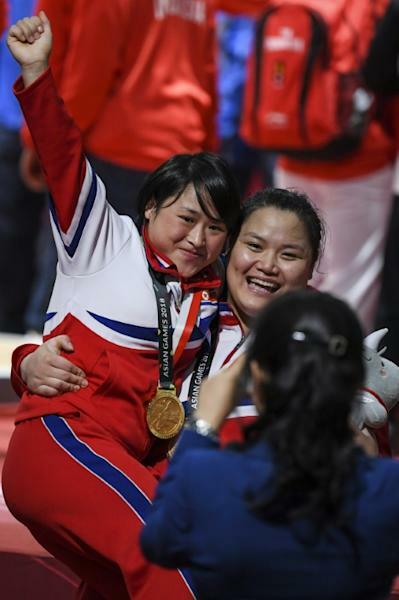 Kim Kuk Hyang extended North Korea's record tally to eight Asian Games weightlifting golds Monday before there were remarkable scenes as they were joined in celebration by their South Korean neighbours. The two countries are technically still at war but it did not stop their weightlifters exchanging warm greetings and posing for photos together as eight days of competition at the Jakarta International Expo drew to a close. South Korea finished a distance behind their neighbours from across the fortified border with three silvers and two bronzes. "Although our rankings were different in the medals table, I think we have shown the world that the people of Korea are the greatest as one," Kim said. "I was worried I would be the only one not to do it, but since I won the gold medal I am very happy," said Kim after completing North Korea's record haul of eight of the 15 golds on offer. They also bagged a silver and a bronze. Kim enjoyed a comfortable win in the heaviest women's class of +75kg with a total of 291kg as the secretive nation doubled their previous highest Asian Games weightlifting best of four golds set at Incheon 2014. South Korea's Son Young-hee took the silver on 282kg and Thailand's Duangaksorn Chaidee the bronze with 280kg. 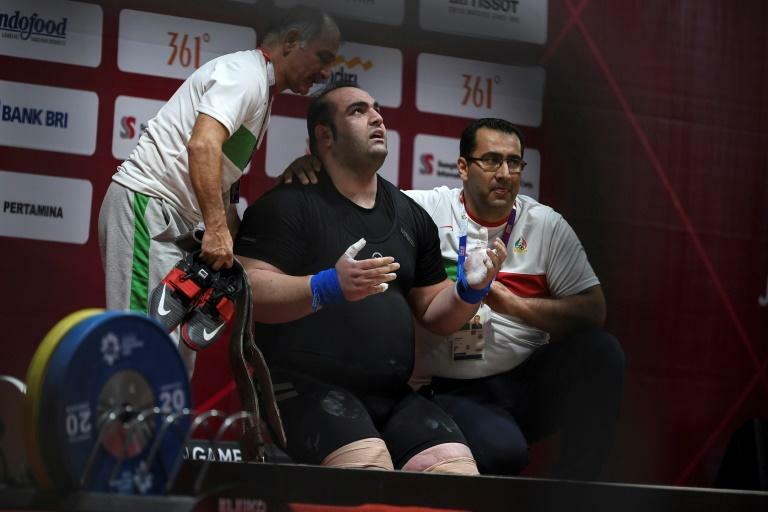 Earlier Behdad Salimikordasiabi became only the third weightlifter in history to complete a hat-trick of Asian Games wins. Salimikordasiabi, the 2012 Olympic champion in the men's superheavyweight (+105kg) class, vanquished controversial doping cheat Saeid Alihosseini in a battle of the Iranian giants. The 2012 Olympic champion Salimikordasiabi revealed he been hampered by a leg injury that required surgery after last year's Worlds in the Californian city. "It had been very hard to train. I don't know how I won. I was determined to do my best. That's why I give thanks to God."